Scientists discovered a novel way to produce 2-D nanomaterials by separating heavy materials from harmless liquid nitrogen. This eco-friendly technique generates a 20-fold increase in surface area per sheet. 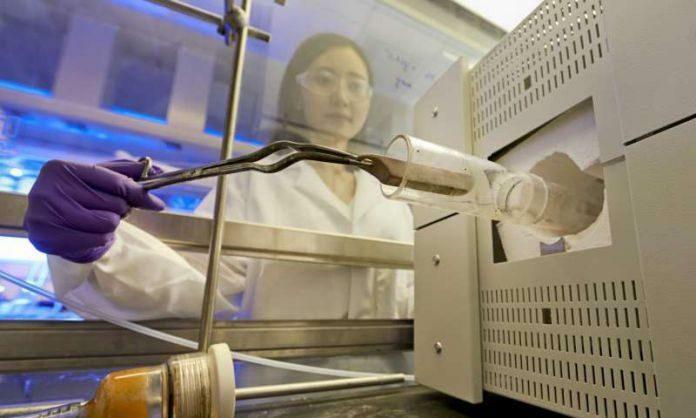 It means it can extend the commercial application of 2-D nanomaterials. This novel research is done by the team of scientists led by the Department of Energy’s Oak Ridge National Laboratory. This new procedure is actually very simple one. Scientists just heated easily available boron nitride in a furnace at 800 degrees C to extend the material’s 2D layer. After that, the material was dipped into liquid nitrogen, which penetrates through the interlayers, gasifies into nitrogen and exfoliates, or separates, the material into ultra-thin layers. Generally, nanosheets produced from boron nitrides could be used in separation and catalysis like converting carbon monoxide to carbon dioxide in gasoline-powered engines. They also may mimic as an absorbent to clean dangerous waste. Due to flexibility and commercial potential of this 2-D nanomaterial, scientists are finding more effective way to create larger sheets. This 2D nanomaterial has a thickness similar to the thickness of one atom. Existing molting techniques use harmful chemicals that generate dangerous by-products and minimizes surface area per nanosheet’s amount. But, in this novel procedure, the surface area of boron nitride nanosheet is 278 square meters per gram. And the surface area of easily available boron nitride material is 10 square meters per gram. Advanced research is planned to extend the surface area of boron nitride nanosheets and testing their flexibility in cleaning engine exhaust and improving the efficiency of hydrogen fuel cells.